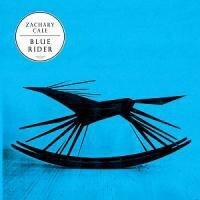 Zachary Cale got the title for his fifth album, the eerily luminous but mostly acoustic Blue Rider from the sculpture on the cover, created by his friend and sometime drummer Ryan Johnson. "Ryan is really into movement. He's interested in Muybridge, the father of cinema," he explains. "So the horse, which to me is kind of folk art image, it's blurring. It's moving rapidly. It's got that futurist element." That combination of folk tradition and modern pace runs through Blue Rider, in the twitchy rhythms that undergird placid melodies, in the threads of synthesizer that run through intricately plucked melodies. Still it was only later, after he'd christened the album that Cale realized his album's title had other connotations as well. "I've always been a pretty big Kandinsky fan," he admits, when asked about the connection between his Blue Rider and the early 20th century school of expressionist painters who share its name. "It was a young school, free and kind of wild in what they were doing with color," he hazards. "Those paintings have a melancholy to them, but a kind of wildness as well." "I feel like this album had both those worlds to it," he adds. "It's like old blues records, too, where there's a melancholy, solitary side, but also a wildness. If you listen to a Robert Johnson record, you hear both." 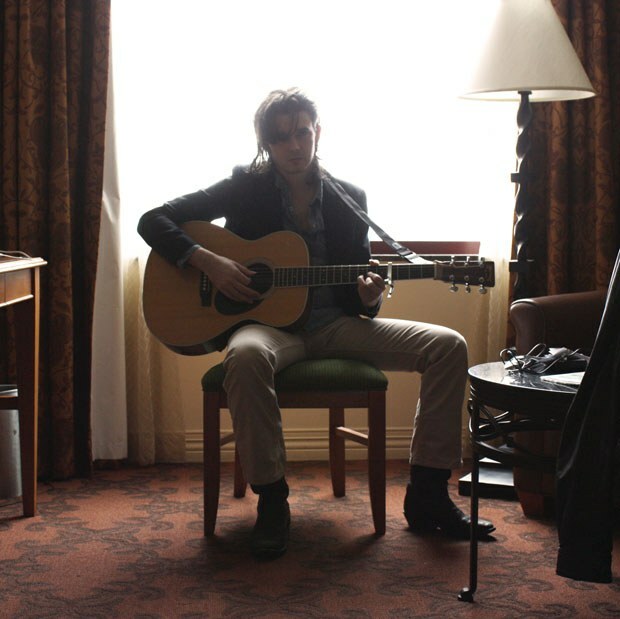 Zachary Cale grew up in Louisiana where, from the age of about 12, he played the guitar. He started, like most teenagers do, on an electric and continued in that vein through the bands he played with at Olympia College in Washington State. But even then, Elliott Smith's music caught his ear, not for the singing or the words, but because of the way Smith played his guitar. "The songs on the first couple albums are so complex," he recalls. "They're not just songs where you sit and strum the guitar. They're not just chords. They're definitely composed." In 2002, Cale headed to New York City. He arrived in the city on a near empty jet; it was September 11th, one year after the Trade Towers attack. "I was like, 'Why is no one on the plane?'" he recalls. Soon after, he heard John Fahey for the first time. "I made the connection right away -- to how he was playing," he says. "I felt like I was trying to play that way before I even knew he existed. It made total sense to me." From there he began listening to old blues music and playing along, painstakingly learning his pickings and tunings by ear. "Mississippi John Hurt was a big one," he says. "Developing that guitar style, I never had a teacher. It was always like listening to records. That's always been the best way for me." Cale admires the old-style pickers, but unlike a raft of Takoma-style revivalists, he says he has no interest in making a solo guitar record. "I think some people missed the point about Fahey. Yet, he's a solo guitar player, but his music is songs. They're all really memorable. The melodies are so catchy to me," he explains. "I feel like a lot of these solo guitar things, it's more about technical ability or drone." That's why, when asked if he sees himself as a guitar player or a singer, Cale says he's both and neither. "I like to think of myself as more of a songwriter," he answers. "I try to merge the two, guitar and voice. I want there to be the perfect marriage." Blue Rider's songs were written over a long period, many of them worked out first while Cale was on the road. "They all have that movement to them," Cale observes. "Even the pretty spare solitary sounding ones move. They're not anchored and slow. They're jumpy in a way." That's partly because of the restive rhythms that Cale builds into his songs, a hiccupping, percussive beat that he learned from country star Buck Owens. "The tunings came from the blues, but for the picking style, I used country rhythms," he says. "These syncopations are pretty much in line with Buck Owens. They have a two-step rhythm. There's a horse clop feeling to them. "I think it's kind of easy to get lost in a noisy bar if you're just purely fingerpicking, if you don't have a syncopated back beat," he adds. "This way it's kind of like I'm beating the guitar a lot more. I can be more aggressive with it, because I have this skiffle beat and melodic lines that are crossing through it. I did this mix of this kind of wild blues stuff and then kind of more like the dance, fox trot type rhythm of hillbilly music." The songs also reflect the movement that was going on in Cale's life when he started them. For instance, he wrote both "Wayward Son" and "Noise of Welcome" (which is different from the album Noise of Welcome) in Berlin, where he spent some of 2005 and 2006. "When I first went, I was in a kind of central area, the Prenzlauer, where you could still see bullet holes in buildings and left-over things from the war were still there," he says. "Now it's really cleaned up. It's super nice. I don't know. I guess all of my friends who lived there have been moving farther and farther out from the city proper I guess. It's like in New York where people are moving to Sunset Park." Cale worked again with Matt Boynton to record Blue Rider; the two have been recording partners since 2005. "We knew it was going to be a guitar and voice type album. We wanted it to be minimal," Cale explains. "I was listening to some real minimal records at the time that just sound massive to me." Cale cites John Lennon's Plastic Ono Band as a prime example. "It's like basically just drums, his voice, piano, drums, a little guitar, a little bass, but his voice is huge," he says. "There's not a lot that sounds like a rock band. Half of the music seems to be cut out of it. And then when you listen to it on big speakers, it just sounds monumental. I'm not saying that my record sounds like that, but I was definitely trying to get that quality." Boynton, who has engineered for MGMT, Black Dice, Gang Gang Dance, and a long list of indie bands, helped Cale crystalize his sound. "My songs can have a murkiness to them. Because I use open tunings there's definitely a drone-i-ness that can sound a little spacy," Cale says. "He will bring that down a little bit and really get the notes and my voice to stand out." Boynton also enabled Cale to capture what he loved about early Sun records and the folk music of John Martyn. "Those Sun records, the early rock and roll, are very minimal sounding. You get the echo and slapback and just it has this mysterious quality. We definitely used this echo slapback stuff on my voice and the guitar, too," says Cale. "I was also listening to John Martyn a lot, a Scottish folksinger who was big into echo as well. He'd use these big space echoes on stage. Which I thought was kind of interesting for a folky. To be hauling space echoes around to folk clubs. He was somebody I was listening to." Cale recorded Blue Rider mostly solo and in single takes, playing and singing at the same time, with Ryan Johnson on drums in an adjoining room for separation. "I feel like my best vocal performances are usually when I'm playing guitar at the same time," he admits. I have a problem divorcing the voice from the guitar, especially the more finger-picky ones. They're kind of melded together." Yet though the album is minimal, live and rooted in older music, Cale says that it is not a folksinger record. "In my mind, I was trying to make sure that it wasn't old fashioned. Though I was using old tunings and acoustic guitar, that's really the only thing that's old fashioned about it," he says. "I wanted it to be mysterious. I wanted it to sound a little more modern. I used a lot of synthesizers on it. It's really subtle but instead of using pianos and organs and mandolins and strings. I didn't use any strings. I wanted it to be a mix of old and new together." Cale says he's not crazy about the recording process – and this one was particularly fraught, since it started as an EP and then expanded, after much discussion, into a full length. "The first recording went really smoothly. We did a chunk of the album, like at least four or five songs, at this session. And I think we automatically knew what this record was going to be, and that was really good," he recalls. "But then we went into this back and forth, was it going to be an EP or a full-length? I don't like records that take too long. This one took a little too long." Still, in the process, Cale got what he thinks of as definitive versions of a couple of songs that he has been playing live for a long time. "I love the break in 'Hold Fast,' the music break in that song. It only happens one time," he says when asked about his favorite moments on Blue Rider. "Also 'Wayward Son,' I like that song, it's been around a long time. It was satisfying to know that I got it finally. I probably recorded that song four times. Certain things like that – I've played them live for years – and you're like, oh, I got the ultimate version of that song. It's kind of satisfying." When we talk, Cale is working that process backwards, translating voice-and-guitar material into full-band arrangements in preparation for a tour with Crystal Stilts. Cale will also be playing guitar with Crystal Stilts. "JB [Townsend] told me that on pretty much all of their records, they've always had a couple of different guitar parts. So he's excited that someone's going to come in and do them," says Cale. "It's mainly little slide guitar parts and some leads. I'm pretty psyched." When he gets back, Cale will go back to the studio, laying down a handful of "western" flavored songs that will make up the core of his next album. "There probably won't be any open tuning finger picking songs at all," he says.